Los Angeles photographers have to work hard to find time to create portraits of a bat mitzvah girl or bar mitzvah boy on their big day because, well, everybody wants to go hang out with their top friends. But it's so important to find the time to craft a beautiful portrait as the girl or boy transition into adulthood in the eyes of the Jewish community. And the parents always appreciate the time that is spent on portraits. This asymmetrical dress was a true showstopper, and it looked so beautiful during this bat mitzvah's ceremony. Once all the traditional readings and mitzvah components are finished, it's time for all the planning to come together for a wonderful party. 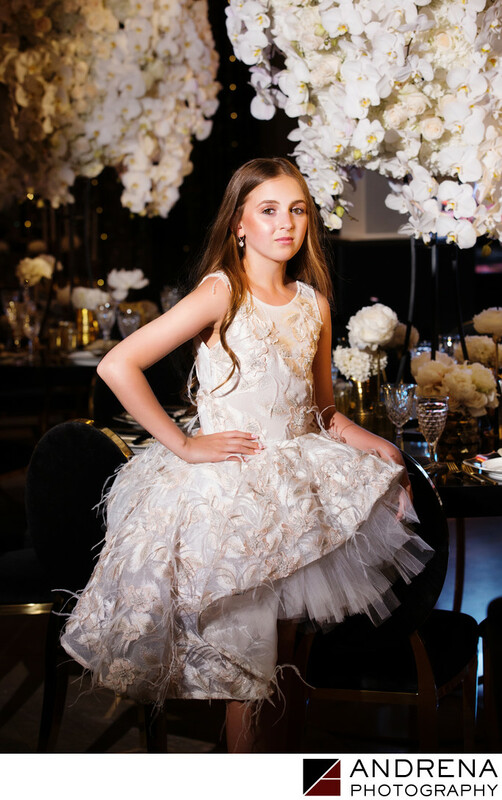 This bat mitzvah took place at the Majestic Downtown, and had a glamorous Great Gatsby theme. Gold confetti canons added to the party theme, as did a massive video display that ran all sorts of custom graphics and movies during the party. This event was coordinated by Aliana Events with florals by Celio's Design and decor by Revelry Event Designers.